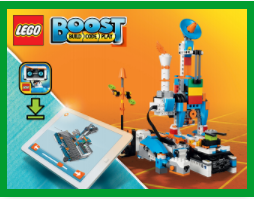 Meet the latest addition to our robotics equipment - Lego Boost - which will fit nicely into the Stage 2 programme, between the Lego WeDo in Stage 1 and the NXT kits in Stage 3. It uses block based programming language. Building - if you have the time, getting the students to follow the very clear instructions to build Vernie would be a great challenge in itself. 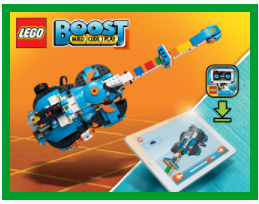 It also gives them the opportunity to complete the step by step programming instructions at each stage of the build. However, you would need to allow close to 3 hours for this. In my position I don't have time for that so I have Vernie ready to go. *Buy a storage box for your build and keep "spare" bricks and "extras" separately in zip lock bags. 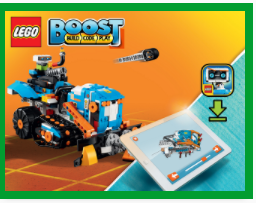 * Up to 5 Boosts can run from one iPad. 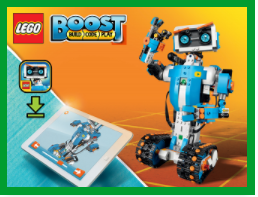 * Sounds come from the iPad, not the robot. 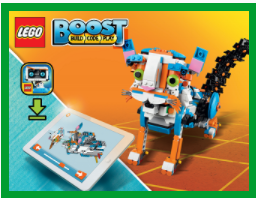 ​*You will need 6 AAA batteries - and a small Phillips head screwdriver to open & close the battery compartment.